Irish rugby fans will know that the Stade de France, scene of many painful Irish defeats by France, is located in the commune of Saint Denis in the northern suburbs of Paris. 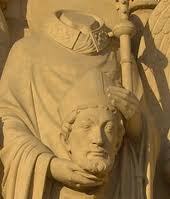 The image shown here is a detail of a sculpture of St Denis carrying his own head on Notre Dame Cathedral in Paris. Patrick Duffy writes about the martyr who gave his name to that that commune. 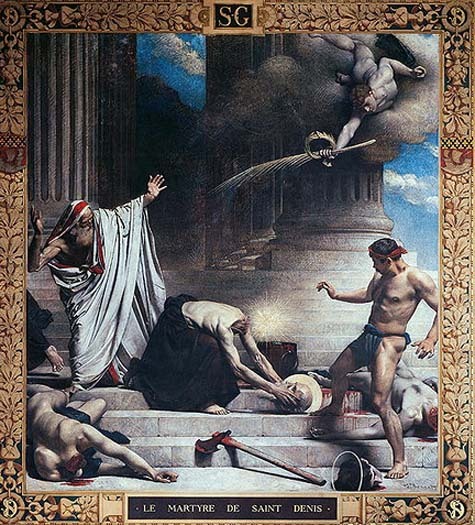 Saint Denis was a legendary 3rd-century Christian martyr and saint. According to his hagiographies, he was bishop of Paris in the third century and, together with his companions Rusticus and Eleutherius, was martyred for his faith by decapitation. Some accounts placed this during Domitian’s persecution and identified St Denis of Paris with the Areopagite who was converted by St Paul and who served as the first bishop of Athens. Assuming Denis’s historicity, it is now considered more likely that he suffered under the persecution of the emperor Decius shortly after ad 250.The image shown here is a detail of a sculpture of St Denis carrying his own head on Notre Dame Cathedral in Paris. Patrick Duffy writes about the martyr who gave his name to that that commune. St Gregory of Tours tells us that this Denis was an Italian by birth and became a missionary bishop. With five companions he established a Christian centre on an island in the Seine. One of his companions was a priest called Rusticus, another a deacon called Eleutherius. They are said to have been executed on Montmartre (“Martyrs’ Hill”) and their bodies thrown into the Seine, from which they were later recovered and given decent burial in a chapel that later became the abbey of St Denis. In the 9th century the cult of St Denis received an impetus by the false identification made by Hilduin, abbot of St Denis, of this martyr with two other individuals. The first is mentioned in Acts 17:34 as Dionysius the Areopagite, who along with a woman named Damaris is among those said to have attached themselves to Paul after his speech in Athens about the unknown God”. The second false identification is with a neo-Platonist Christian spiritual writer from around 500 AD who had written pseudepigraphically, that is, maintaining the persona of the same Dionysius perhaps hoping to increase the authority of his writings. This led to the re-writing of the history of Denis the martyr as well as the exponential growth of his cult – with the additions of such legends as the one claiming that he was a cehpalophore, or”head carrier”, that is one of those martyrs who is said to have carried his head to his place of burial. Because of this, Denis’s cult also spread rapidly to England where a great number of churches were dedicated to him and given his name.